I'm having an unsatisfying experience playing this game since I really don't know what should I do first and each of my playthroughs endS with the enemy stabbing me in the back after conquering another territory and being left with a few soldiers too weak to defend with before being finished off. Since there's no guides or FAQS around. What'S the recipe for success in conquering ROTK12? With that said, just save some troops in the city and attack when you know you can win, the AI is pretty stupid so it will be easy to def against 50k enemy with 20k troops if your officers are good enough for the job, if they aren't, even with 100k army consist of a bunch of pathetic average 70-80 stats officers against 20k Lubu unit, you won't even hold a candle against him. Trust me on this cause i found out the hard way while playing Tao Qian, was replaying over and over because Cao Cao just straight up destroyed my force at turn 10 or something if i don't cheat, even with cheat to have more troops than him at a reasonable amount, he still destroyed me because his officers are just way too good. (Playing as Lu-Bu force in Rise of Heroes) What should I do first? Should I build academies and upgrade my troops and build some siege weapons? What are the most helpful secret policies to use? How effective are those guard posts? How many markets and farms should I build and at what level should I upgrade them? I usually get High Int and Pol officers during the earlier phases. Huang Riong wrote: (Playing as Lu-Bu force in Rise of Heroes) What should I do first? Should I build academies and upgrade my troops and build some siege weapons? What are the most helpful secret policies to use? How effective are those guard posts? How many markets and farms should I build and at what level should I upgrade them? In the beginning, Guard station, Academy aren't good enough to waste a lot on them at the beginning if your city isn't big enough, no need to build academy until you have quite a lot of officers (sieges are the fun destroyer of this game, try to not use them), try to stock up load of troops, food and gold, espccially gold cause it's vital at the beginning to get as many decent officers as you can and keep their loyalty at bay. Build something like 1 smith, at least 3 markets, 1-2 farms, 1 barrack, 1 recruit/hire/search officers building and fill the others with plot house. Your starting goal is trying to get gold, food while having decent amount of troops. Then use food or gold to ceasefire/ally with any dangerous forces around your city except the one you try to take, in your case, you should try ceasefire/Ally with CaoCao, attack whatever city you want, you won't need to worry about the forces around your first because they won't attack until ceasefire expired. 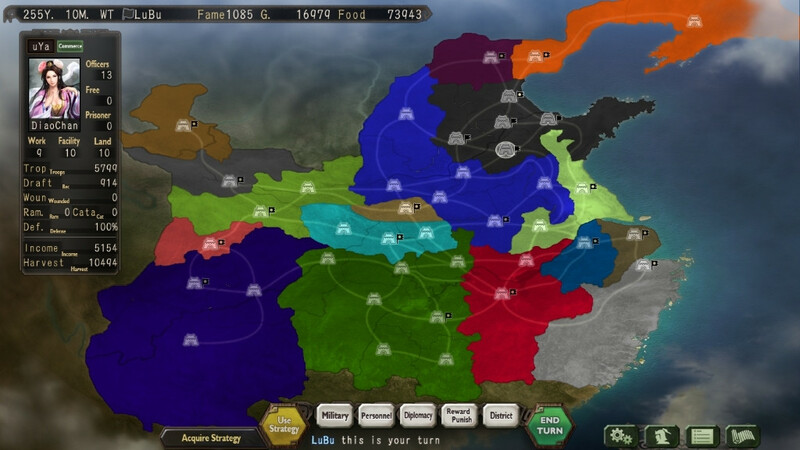 It all started when Yuan Shao decided to attack me once the treaty had ended and things have escalated so far. With Gongsun Zan weakened thanks to Liu Yu's attack and the plentiful amount of officers recruited, I could conquer the Highlands in no time. Although my alliance with Cao Cao is soon ending. Should I press the attack on the Northern lands? or should I focus on recovering?